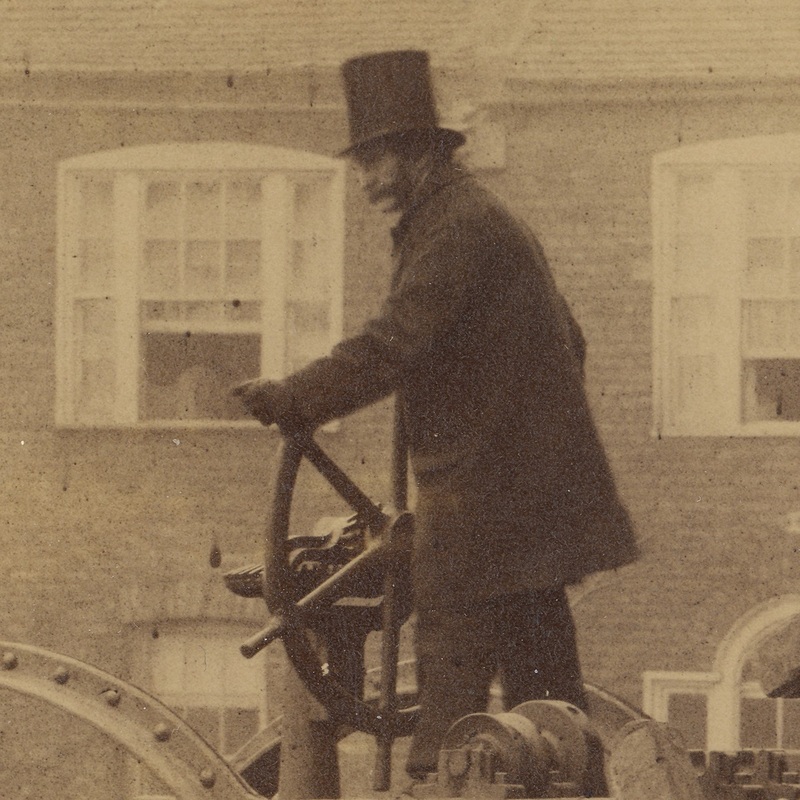 At first sight, it appears to show a dastardly Victorian villain attempting to flee the scene of some dark deed aboard a horseless, minion-powered vehicle with feet on its wheels! Has the fiend left a distressed damsel tied to the tracks of the railway viaduct to the right? Will someone save her from the rushing wheels of the Scotch Express, due any minute??? Worth a spot of research, I thought. Sadly (or perhaps not, if you happen to be a Victorian damsel (or, indeed, a train driver)), the reality, such as I’ve been able to glean, turns out to be somewhat less dramatic, although still quite interesting. The photograph shows a man-powered Burrell-Boydell tractor transporting dressed stones on an urban building site. 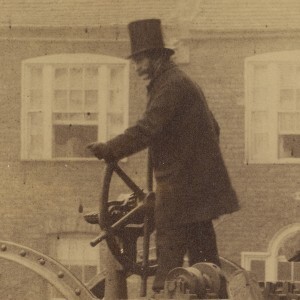 Its curious wheels were constructed by C Burrell of Thetford, Norfolk, to James Boydell’s 1846 patented “dreadnaught wheel” design. This precursor of the modern caterpillar track had several articulated boards loosely attached around the circumference of each wheel and pivoted so that any two adjacent boards formed a flat wooden road beneath the wheels. The weight which would otherwise be concentrated on the ground through the wheel rim’s small point of contact was thus spread over a much wider area, preventing the carriage from sinking into, say, loose earth. 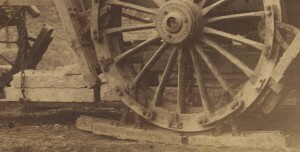 Detail of “dreadnought wheel” also showing dressed stones hanging beneath the carriage. The huge driving wheels at the rear of the vehicle were geared to two smaller wheels above them which, in turn (and in the absence of giant hamsters) were each pushed around by two men. Presumably the occasional use to which this particular tractor was put did not justify incorporating a steam engine, or perhaps the weight of a steam plant would simply have made the carriage too heavy for the site. The stones being transported are slung beneath the carriage, having been lifted clear of the ground by the on-board winches. So quite a nifty bit of kit, and “zero-emission” too! One thing I haven’t been able to establish is the location in the photograph. Does anyone recognise any of the buildings in the background? It would be brilliant to discover what was being built and what’s there now. Comment from New Zealand: Certainly a ‘nifty bit of kit’ as you put it! I’m thinking James Boydell could have been the Father of ‘Kiwi ingenuity’. What,what….! A truly brilliant man for his time! I find the articulated boards loosely attached around the circumference of each wheel and the way they are pivoted absolutely amazing. Regards, Kit. Thanks for your comment Kit! Yes, I love the effortless way in which the boards are deployed by gravity to prevent said gravity from pulling the carriage down into the soft ground. Genius! 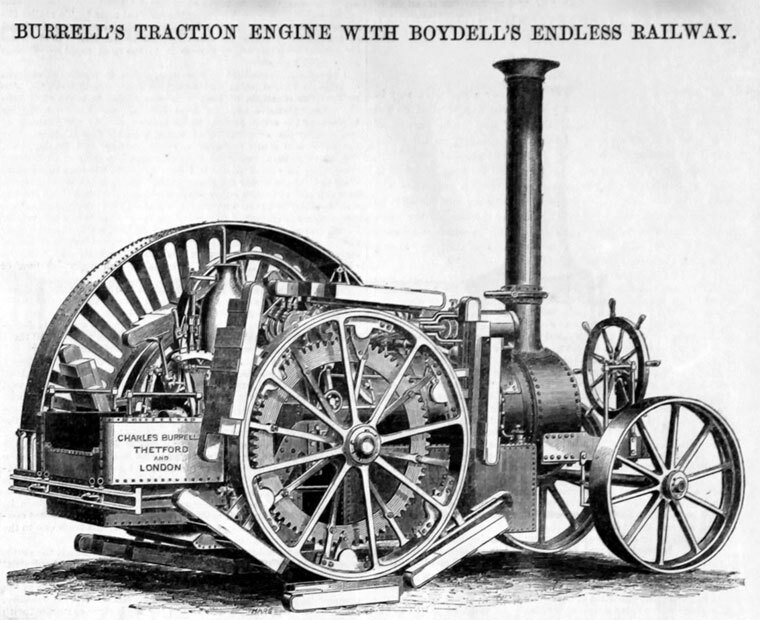 It is the James Boydell Endless rail wheel see https://en.wikipedia.org/wiki/James_Boydell I can’t locate that photograph, but he worked with Tuxford and Burrell to have them fitted to steam traction engines. This photograph of yours may be an early prototype made of wood and perhaps to have a portable steam engine fitted in. Thanks for your reply, Daniel. I’m getting “page not found” for your last two links but will keep trying! 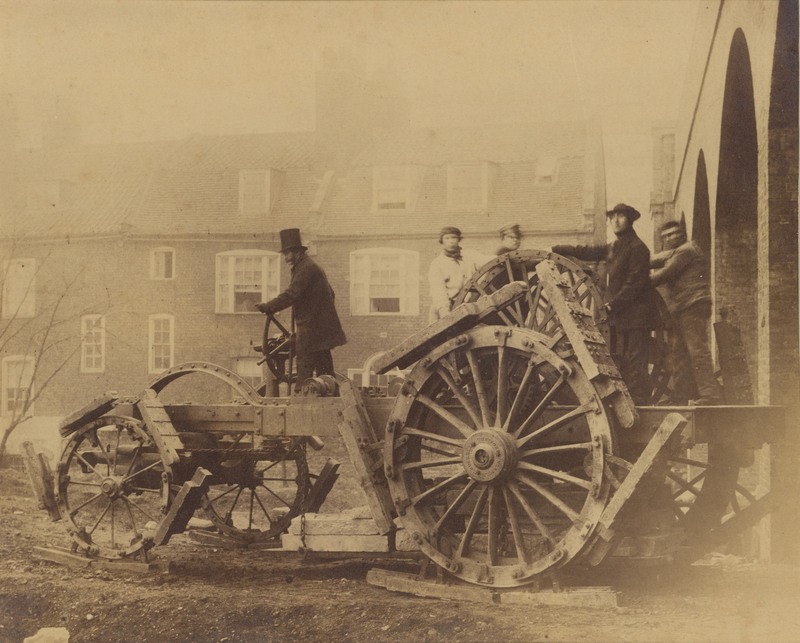 It’s taken in the mid-1850s at Camden Works, Camden – where Boydell and Glasier were based and shows one of the early engines they were making at a point where they were (presumably) waiting for the steam engine and boiler to be supplied by Garrett’s. The handpowered wheels and the weights are, presumably, a temporary measure the check that it can move ok before the rest of it arrives and is fitted. The wheels on this one I believe came from Woolwich Arsenal and not Burrell who weren’t involved at this point. Thanks for your reply, Tony. Hmm…but if you click on the pictures and look at the hub of the large wheel you should be able to make out the words “Burrell Thetford Norfolk”. Might this be consistent with the date of 1880 (as mentioned above) written on the back of the print? Hadn’t spotted the Burrell name there – but on the other hand they may have been supplying castings for the wheels as they look like reasonably standard ‘Artillery Wheel’ hubs. Not sure where we could check that. Unfortunately, I don’t know how to add a couple of sample pictures to this site. Oo, interesting! I don’t know if it’s possible to add photos in these comments, but if you get any pictures or videos up anywhere else you could post a link. Thanks for your comment! I’ve seen illustrations of the Boydell wheels on a steam engine, but this is something quite different. Thanks for posting it. Hi Sam, thanks for your comment. I just had to share such a fantastic picture!